It's a Bird! It's a Plane! It's a...House? It was all part of the installation of a new sculpture for the Stuart Collection, which brings site-specific works of art to the UC San Diego campus. Other pieces in the collection include Sun God, near the UC San Diego Faculty Club, and Bear, in the Engineering Courtyard. The project is supported entirely by private donations to the Stuart Collection and a $90,000 grant from the National Endowment for the Arts. This latest work is titled “Fallen Star” and is a three-quarter-sized version of a house in Providence, R.I. The entire sculpture consists of the house, cantilevered at an angle from the corner of Jacobs Hall, also known as EBU 1, surrounded by a roof garden. 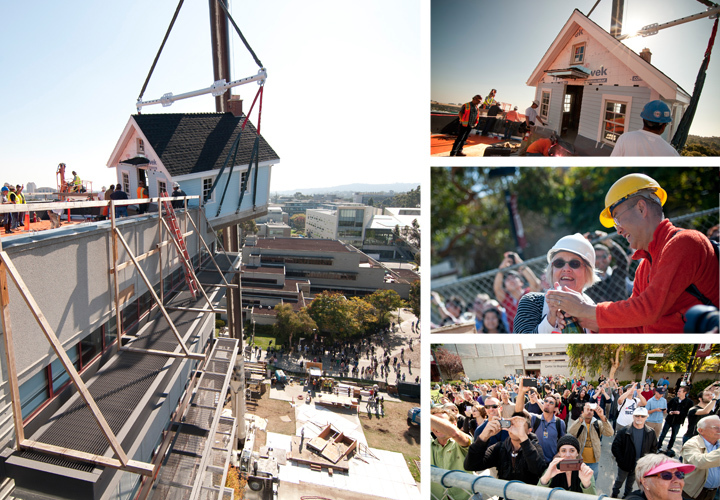 Hundreds of people craned their necks, pointed to the sky, snapped pictures and finally applauded as the crane slowly raised the house 100 feet in the air. Most onlookers were students, faculty and staff members on their lunch break. He had been watching the project’s progress from the fourth floor of Jacobs Hall and came out to Warren Mall for the hoist. As an engineering major, he said he was impressed by the feat the house represented. It would be complicated enough to bring a square house, at level, on the roof of a building, he pointed out. But the floor of the artwork sits at a 5-degree angle from the flat roof of Jacobs Hall, and the house itself is built at another 10-degree angle, creating an instant feeling of sea sickness or vertigo for visitors who enter it. The artwork also was built to withstand winds of 100 mph and conforms to California earthquake building codes. The concrete foundation is 18 inches thick, compared to 4 inches on a regular house. The house weighs in at about 70,000 pounds. “Leave that to structural and mechanical engineers,” Forencich, the electrical engineering major, commented. Nearby, Robyn Lovell, a philosophy major, was pondering the artwork’s implications for design and architecture. “It’s pushing the envelope of what you can do,” she said. Lovell added she would definitely visit Fallen Star once it’s open to the public. That should happen sometime this spring, in February or March. There is still quite a bit of work to be done. The house’s interior needs to be finished, and it also needs to be furnished. Finally, the roof surrounding it has to be converted to a garden with plants native to the East Coast. Access to the work will be via Jacobs Hall. The team working on Fallen Star truly made the impossible possible, said Mary Beebe, director of the Stuart Collection, noting that the project is probably the collection’s most complex one to date. She also said she was grateful for the support she received from the Jacobs School of Engineering. The house was designed by Korean artist Do Ho Suh. Since graduating from Seoul National University, the Rhode Island School of Design and Yale University, he has led an itinerant, globe-trotting life. During his first move from Korea to the United States in 1991, he recalls feeling “as if he was dropped from the sky.” That’s a feeling he hopes to recreate with this latest artwork, which explores that feeling of displacement and the notion of home. Suh said he hopes the piece will speak to students at UC San Diego.